There’s a trio of new VW Golf Estates for fans to choose from and showrooms are taking orders for delivery in August. 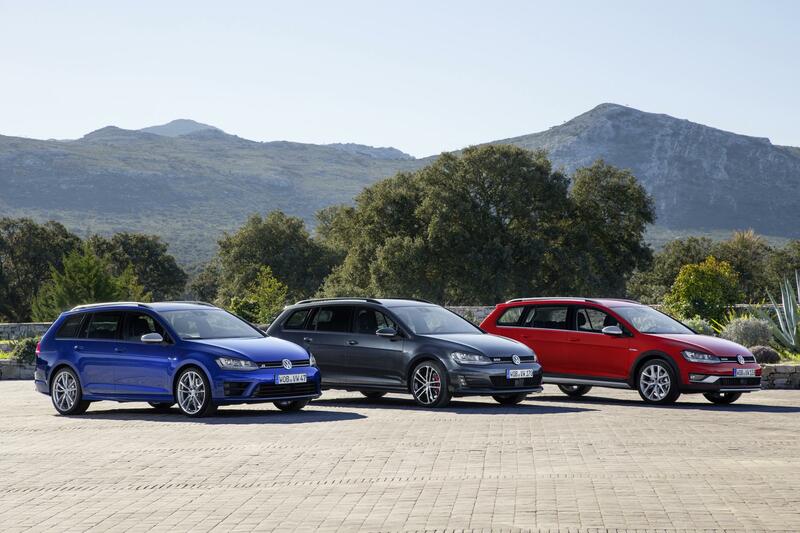 The line-up consists of the VW Golf GTD and R Estates as well as the VW Golf Alltrack. Essentially, the Golf R and GTD are slightly longer than their popular hatchback siblings and have similar trims though the boot space has been increased from 380litres to 605litres. More impressively, the available boot space will increase to 1,620litres with the rear seats folded flat. The VW Golf Estate Alltrack comes with a choice of three engines with power outputs ranging from 110 PS. The GTD has power of up to 184 PS while the top of the range VW Golf R Estate has a useful 300 PS underneath the bonnet. The VW Golf R Estate has the hatchback’s 2.0 litre turbocharged four-cylinder petrol engine which will take the car from 0 to 62 mph in just 5.1 seconds. The top speed in this car has been electronically limited to 155 mph and its trim and equipment levels are the same as the hatchback though this version only comes with the firm’s six-speed DSG. In addition, opt for the R Estate or the Alltrack and owners will find their vehicle comes with the firm’s 4Motion four-wheel-drive system. VW says its GTD Estate is a booted version of its iconic long-distance sports cruiser and this has a 2.0litre TDI engine which will produce 184 PS and go from 0 to 62 mph in 7.9 seconds. It has a top speed of 143 mph. However, even with this performance owners will find excellent fuel economy; the VW Golf GTD Estate will return around 64 mpg on the combined cycle with CO2 emissions of 115g/km. This estate comes with a six speed manual gearbox and the DSG version is offered as an option. There’s also bound to be a lot of interest in the Golf Alltrack which follows very closely in the footsteps of the excellent VW Passat Alltrack. This estate version comes with higher ground clearance, has flared arches and side sills for more protection and the excellent all-wheel drive 4Motion system. Opt for the Alltrack and there are three engines to choose from and all of them, as you would expect, offer very good performance. Prices start at £26,790 for the VW Golf Alltrack 1.6litre TDI and rise to £33,585 for the VW Golf R Estate. This entry was posted in Car Leasing, Car Updates & Releases, Cars, Family Car, Popular Cars and tagged lease a vw golf, Volkswagen Golf, vw golf by Steve Lumley. Bookmark the permalink.